A combination of restricting calories and exercising more to create a calorie deficit is the best way to lose weight, confirmed a review in Obesity Reviews from 2015. You may find weight gain accelerates and loss is harder once your reach 50, but that doesn't mean these strategies don't work. You've lost muscle mass at a rate of about 8 percent per decade since age 40 as a natural byproduct of aging, and this diminishes your daily calorie burn rate. Your testosterone levels naturally decline, too, after the age of 40, causing more fat to store in your abdomen as belly fat. As a man reaches 50, he burns between 2,000 and 2,800 calories per day, depending on activity level. Compare this to the 2,400 to 3,000 calories he burned when in his 20s and 30s. Although this reduction in caloric expenditure doesn't seem like a huge difference, realize that a pound of fat equals 3,500 calories. If you continue to eat as you did when you were younger, or eat more, and move less, you can easily pile on extra pounds. Use an online calculator that takes into account your gender, age, size and activity level to determine your daily calorie-burn rate. Then, subtract between 500 and 1,000 calories from it to figure how many you should eat daily. Eating fewer than 1,600 calories daily is considered a low-calorie diet for a man and should be monitored by a dietitian, since it could cause you to miss important nutrients, feel overly hungry, stall your metabolism and accelerate muscle loss. Raise your daily burn rate with exercise if cutting calories alone leads to too great of a deficit -- for example, you can create a 1,000-calorie deficit by eating 500 fewer calories and burning an additional 500 through exercise daily. If you're not already strength-training, start now. The weight room floor is not reserved for men in their youth. Lifting weights helps offset the natural loss of muscle mass as you age and builds it instead, and this contributes to a higher metabolism. Address all the major muscle groups -- legs, arms, shoulders, chest, back and abs -- with a program two to three times per week on nonconsecutive days. Start with a modest weight that fatigues you in one set of eight to 12 repetitions and progress to heavier weights and additional sets as you become stronger. If you're coming back after a long hiatus, don't let your ego start you back at the weight level you lifted when you were in prime shape. Ease into lifting gradually so you don't cause injury, and consult a personal trainer to ensure you're using proper technique. 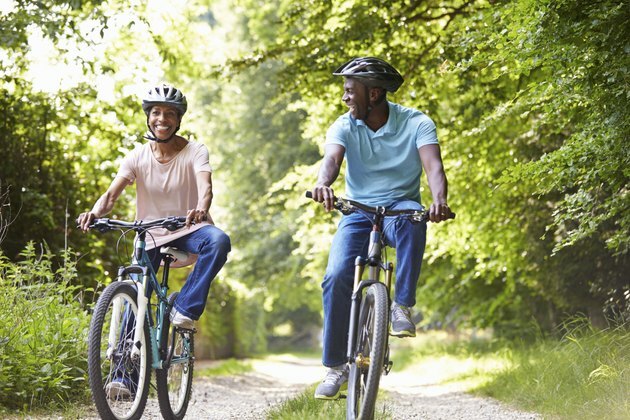 Cardiovascular exercise, such as brisk walking, cycling or jogging, can prompt weight loss, but only if you do it for 250 minutes per week or longer, reports the American College of Sports Medicine. Go for a moderate-intensity, or complete intervals of all-out intensity combined with low intensity, to stimulate greater fat loss. A paper published in the Journal of Obesity in 2011 showed that interval training consisting of six seconds to four minutes of all-out work with equal or slightly longer recoveries enhances fat loss. Daily Mail: Why DO Men Lose Weight Faster Than Women?